When we get excited about new additions to the showroom, it’s a very big deal. 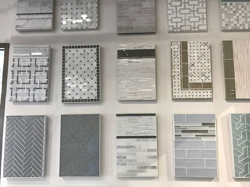 Unlike other remodeling or furnishing centers, International Bath and Tile makes it a point to give our clients diverse and unique options to make their projects truly spectacular. Our range of our brands, from globally renowned names to bespoke artisan makers, affords our clients a range of options to accomplish their design and production goals with ease and inspiration. These are the 12 new products from some of our favorite brands in our IBT San Diego showroom that are giving all of us something to get excited about. Brizo’s Litze Collection have a very industrial look to them—almost as if the pieces have been taken straight out of a mechanic’s toolbox. The brand’s newest finishes are made of bronze and satin brass, and the handles are interchangeable, so you can mix up your look day-to-day if you choose. Ronbow’s Signature Series is known for its high-end sinks and vanities. Their designs are sophisticated and come in interesting shapes, sizes, and colors. 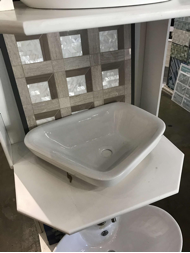 The sinks have a very European feel to them, and can be dropped as an under-counter sink or left as a freestanding, above-counter sink. Ronbow gives our clients the opportunity to upgrade their basic white sink for something so much more exciting. You can coordinate your entire room with Stone Mar’s tile series. 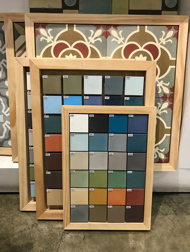 You can choose tiles from the decorative line and continue the same coloring elsewhere with the matching solid colored tiles. The price point, availability, and durability make Stone Mar a brilliant décor option. The Italian brand Catalano offers fantastic designs in very unusual finishes. While most sinks come in a glass white, Catalano’s sinks come in a satin or pearl finish. 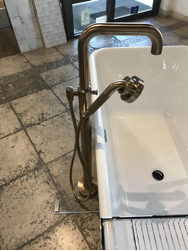 These amazing finishes also come in interesting shapes and sizes and can easily add a contemporary, European look to your bathroom. 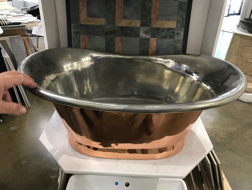 The dual copper finishes on William Holland’s basins make them different from anything else. 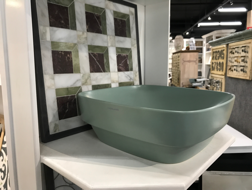 If you want a unique, sculptured piece for the powder room, this English brand has a great selection. Adex offers well-priced tiles that are on par for the quality of handmade designs. With Adex, you can stick with the clean lines of subway tile and trim or venture out into a more unique shape. Because these tiles are in stock, they can be in your home in just a couple of days. If you want something truly engaging, the Eleganza series will catch your guests’ eyes. 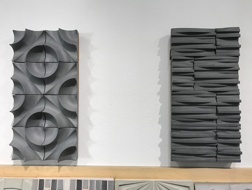 The unique 3D tiles are made of porcelain, but look like stone. The sheets come in a larger size (48×48), but are light for easy installation. 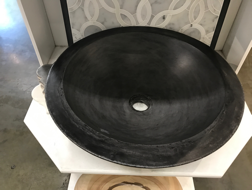 Native Trails has created a line of “concrete” sinks for a minimalistic, contemporary design that can be featured in the bathroom or kitchen. The brand has imitated the look of concrete so well that the color is true throughout, making chips and scratches unnoticeable. 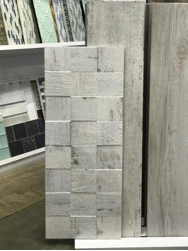 Trendy Surfaces’ porcelain tiles can be used on the floor and walls so you can do a complete bathroom with its unique, three-dimensional design. Its neutral color tone and weathered look add a softer, but no less appealing, look. The tile is well priced and has just a two to three day delivery time. What’s amazing about Akdo’s series is that its tiles go from glass to stone to marble—there are so many variations. 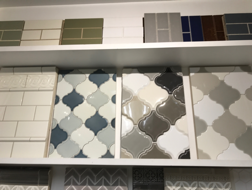 The tiles are extremely well priced, but what’s more, you can count on the consistency in the texture and colors. What you see in our showroom is the same look that’s delivered to your home. Island Timber uses Indonesian teak wood reclaimed from old boats in most of its lines. The designs come in different sizes, in natural shades and even color. It’s also three-dimensional, to give a room a unique look. 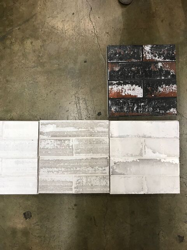 While it looks like real brick, Ken Mason’s weathered brick tile is actually made of ceramic. Handmade in Long Beach, the design is just one of the incredible designs from the brand. Visit our San Diego showroom to see these designs for yourself. 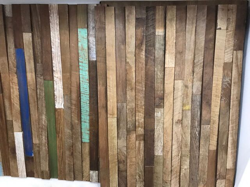 Our team will be more than happy to work with you and help you incorporate these brands and others into a unique and stunning design for your space.